John Honeyman & Keppie designed a two storey, yellow sandstone Italo-Scots Renaissance-detailed building fully equipped to meet the requirements of a medical school. Authorship: The contract for Anderson's College was awarded to James Sellars in 1887 and under his supervision a design was drawn up by John Keppie in early 1888. Following Sellars's death later the same year, Keppie brought the contract into the partnership with John Honeyman. 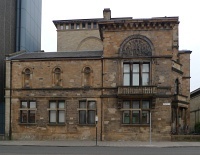 Mackintosh joined the newly established practice in 1889. There is no evidence to suggest that Mackintosh contributed to the design. Alternative names: The Anderson College of Medicine. 1: Glasgow Herald, 23 October 1889, p. 9.